A settled end to the month with a good run of waders on the coast. The reservoirs have been pitiful so far this autumn but hopefully they will produce something in the next 3 months to make the cost of my annual permit worthwhile! 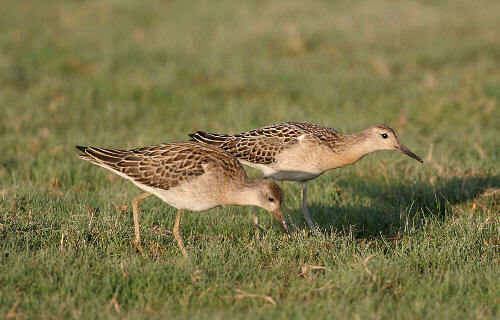 Two Ruff continued to give very good views on a puddle next to the Severn Way footpath on Northwick Warth. An American Golden Plover that flew over Middle Hope near Weston-super-Mare this morning was only the 3rd Avon record. This would have been nice to see but hopefully my luck will improve soon. It seems I was hasty with my comments yesterday. 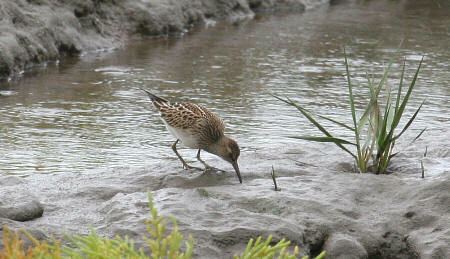 Amazingly a second Pectoral Sandpiper was found on Northwick Warth. The two birds showed well at dusk. No new birds to report today but I went back for another look for the Pectoral Sandpiper this morning and found it in the same area. It showed closer in better light conditions today so I took a lot more pictures after all, it could be years before we get another here. 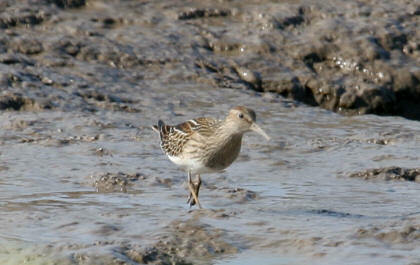 Another good bird was found locally this morning; only the second ever Severnside record of Pectoral Sandpiper. It showed very well on the edge of the salt marsh on Northwick Warth where 3 Ruff and a Little Stint also gave excellent views. The area looks very attractive for waders at the moment and I am sure some other good birds will be found here in the next few weeks. Today was a day of lows and highs. While in work this morning I received an email about a Yellow-browed Warbler at Portbury Warth. A few telephone calls later things got worse when I was informed about 2 Buff-breasted Sandpipers, a Semi-palmated Sandpiper and 3 Pectoral Sandpipers just North of Avon at Slimbridge. Today was not a day to be stuck in work. When I did get home this evening I was told that the Portbury warbler had not been seen again so decided to have a search locally for my own American waders. At 5.30 I received yet another call to say that an a Osprey had just landed behind Chew Valley Lake. Knowing this would be one of the last chances to see one of these birds this year, I dashed the 25 plus mile south through the heavy Bristol traffic arriving at the site in 45 minutes. A few minutes later I received another call to say a Kentish Plover had been found 150 yards from my house! The few birders present dashed back to the Stratford Bay hide to relocate the Osprey and there it was giving distant views at about a miles range perched on a dead branch of an Oak tree. Not the best views but with the light fading, myself and a fellow year lister ran back to the cars to start the drive back to Severn Beach. Luckily the bird was still on view when we arrived and without the aid of a torch I was watching only my third Avon Kentish Plover, but first for the year. Having to work most of the weekend and with very low high tides I didn’t expect to see very much but a few more Barn Owl, Curlew Sandpiper and Little Stint sightings in the last few days were nice. An Osprey (perhaps two) was seen at Chew Valley Lake briefly today. Hopefully one will linger for a few hours and give me the chance to see it. An Avon rarity at last. 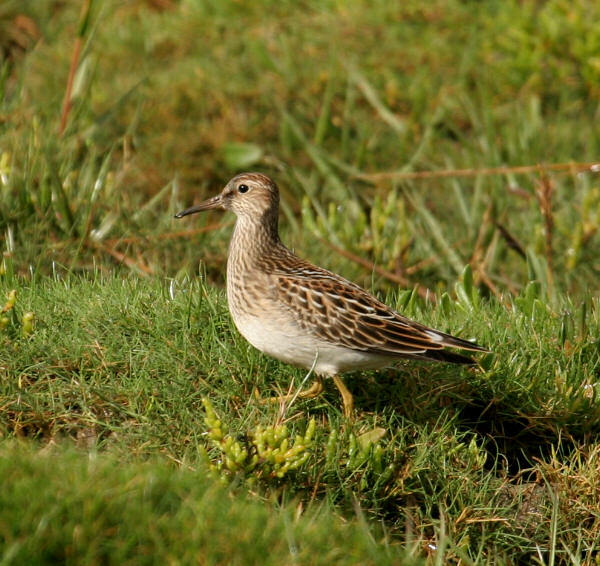 At midday I received a call about a Pectoral Sandpiper that had just been found near Channel View Farm, Clevedon. Less than an hour later I was there in the heavy rain watching this small Nearctic wader feeding reasonably close to the sea wall with a small group of Dunlin and Ringed Plovers. Earlier in the day there had been a “fall” of migrants on Severnside due to the overnight rain. At least 2 Redstarts, a Spotted Flycatcher, 40 Blackcaps, 6 Whitethroats and 8 Chiffchaffs were found in a brief search. The day ended with the amazing spectacle of 3 Barn Owls hunting over Aust Warth at dusk, the highest count here for decades. No new birds to report other than some near miss sightings of Pectoral Sandpiper and Bonapartes Gull just a few mile North of Avon at Slimbridge. I heard about 2 Sandwich Terns well after dark that had been seen at Chew Valley Lake this afternoon. I hope that these are not the last of they year but my gut feeling is I only have a few more days to see this Tern that I have seen in most recent years. Locally, on Severnside, duck numbers have risen dramatically today with 250 Teal and 50 Wigeon, a strange sight with 16 Common Terns amongst them. Yesterdays 14.2 metre tide flooded the “flash” on Northwick Warth and in less than 24 hours it was found by 2 Ruff this evening. With the County’s lakes being so full this autumn these will be difficult to see elsewhere this year. A Barn Owl was found here this evening and then I missed the first Severnside patch record of Nightjar when a female was seen at dusk by another birder looking for the Owl. The 14.4 metre high tide this evening will flood the warth again, hopefully increasing the chance of some other good waders finding the wet pools. 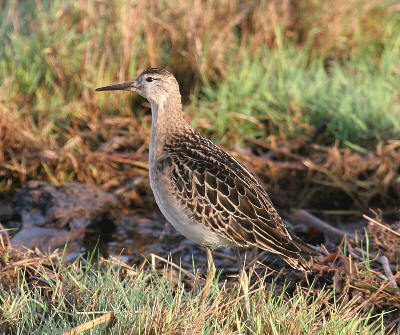 Yet another good bird was found yesterday across the estuary in Gwent. 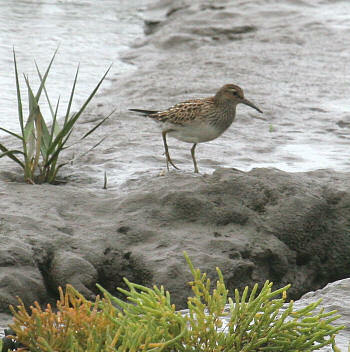 Hopes were raised this morning when the juvenile Semi-palmated Sandpiper had disappeared from Goldcliff but it did not appear here at Severn Beach and as yet I haven’t heard of it being seen anywhere else. An after work walk along the shore at Severn Beach produced some birds of interest but the best 2 were found by visiting birders who kindly told me about them. The first was an exhausted adult Gannet that floated up river, beneath and then beyond the Second Severn Crossing. 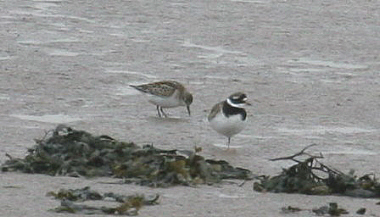 The second was a Little Stint found in the mixed flock of 350 Dunlin and Ringed Plovers. Other waders seen this evening included 12 Sanderling, 4 Knot, a Whimbrel and 6 Bar-tailed Godwits. 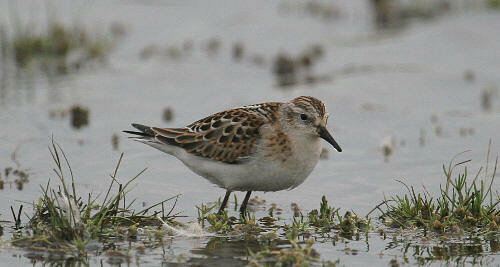 I managed to take a distant record shot in the evening gloom just in case this is the only Stint I see this year. The strong South West wind continued so seawatching was the order of the day. The afternoon high tide at Severn Beach did not live up to expectations producing just a very distant Fulmar, 2 Kittiwakes and 4 Scaup. Reports from further down the estuary included a Balearic Shearwater, a few Manx Shearwater and a Gannet from Weston-super-mare and 2 Arctic Skuas passed Goldcliff in Gwent. On September 3rd 1983 just north of Severn Beach at New Passage, there were 40 Leach’s Petrels, 7 Storm Petrels, 3 Sabine’s Gulls, 10 Manx Shearwaters, 20 Gannets and 6 Arctic Skuas. Those were the days! A blustery start to the month. While watching a flock of 300 waders on Severn Beach, I saw two dark birds flying low and fast over the water, eventually they turned back towards me and my impression was that they were Shags. They dropped onto the rough water. I decided to walk back towards the “burger bar bay” near the Second Severn Crossing in the hope of seeing them again at closer range as they drifted in with the tide. 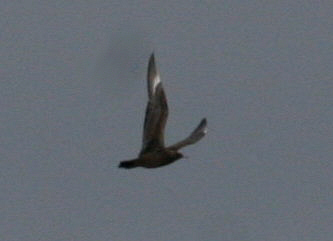 I waited for an hour but only managed to see a dark phase Arctic Skua that continued over the crossing and headed up the estuary. I then went home disappointed not confirming the identity of the 2 birds seen earlier. An hour or so later I realised the wind and increased in strength and had moved to a more productive South West direction so at 4.30 I was sheltering on the burger ramp when a Razorbill floated down river about 150 metres from the shore on the falling tide. At last a new bird for the year and with some more moderate winds predicted tomorrow hopefully some more seabirds. 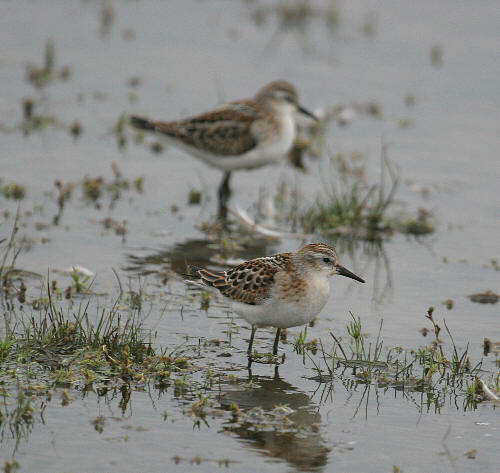 A Little Stint was reported just down the coast today at Royal Portbury Dock.